Image courtesy of National Gallery Singapore. 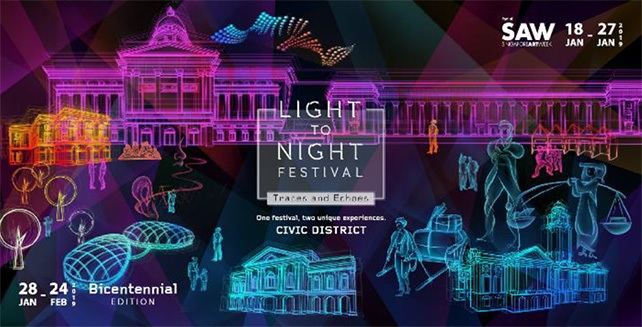 Celebrating Singapore’s Civic District, urban art event Light to Night Festival returns once again, bringing accessible artworks and a range of creative and artistic expressions to audiences. Over two weekends, the festival will play out in some of Singapore’s most iconic settings, and include artworks and events like public art commissions. Look out for the return of Art Skins on Monuments by Brandon Tay and Safaun Johari, outdoor installations by Tell Your Children and MessyMsxi, as well audio installation Under the Five Trees in Esplanade Park and the Common Life exhibition which will take audiences on a visual and poetic journey across scenes in everyday Singaporean neighbourhoods. Rounding out the festival will be performances at Victoria Concert hall, home of the Singapore Symphony Orchestra (SSO), and free guided tours of the Victoria Theatre and Concert Hall. The Empress Lawn and Connaught Drive look set to be transformed with a wide array of food and craft stalls, perfect for picnicking and taking in the vibrancy of Singapore’s Civic District.